The first book to focus on non-traditional, emerging disabilities and their implications for rehabilitation practice. Emerging disabilities are disabling conditions that are either new to medical science, often medically debated, and lacking in known etiology; or those increasing in prevalence in recent years. 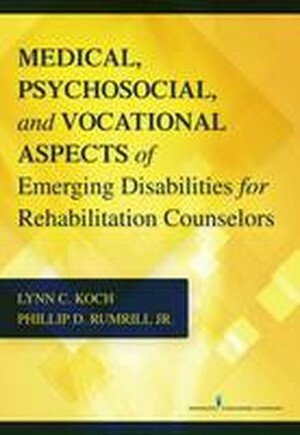 This master's level text is the first to eschew traditional disabilities to focus specifically on the unique characteristics and needs of individuals with emerging disabilities (i.e. multiple chemical sensitivity, fibromyalgia, Lyme disease) or those currently increasing in prevalence (i.e. diabetes, autism, PTSD), and explore their implications for rehabilitation counseling practice. The text is also unique in its examination of how disability causes, types, and patterns are changing in response to current medical, social, cultural, and environmental trends and in addressing necessary changes to rehabilitation policies and practices to better serve consumers with emerging disabilities. The book explores important sociological and environmental phenomena such as global warming, pollution, poverty, violence, migration patterns, addiction,and substance abuse, and the changing age demographic of the U.S. that has altered the landscape of disability policy and rehabilitation services in the 21st century. Each chapter provides specific examples of disabling conditions and discusses their medical, psychosocial, and vocational significance. The authors examine implications for rehabilitation assessment, planning and placement, and emphasize changes needed to rehabilitation policy and practice. The text is replete with practical evidence-based strategies for meeting the psychosocial and vocational needs of people with emerging disabilities. Each chapter includes case examples, learning objectives, and discussion questions. An instructor's manual accompanies the textbook.